Not many jobs hold as much appeal as that of a pilot. The freedom, the blue skies and the adventure draws people from all walks of life to find a way to get their flying license. Often times, those wide-eyed dreamers find a recruiter’s office to be a great avenue for their aspirations. Since around age ten, Jennifer West has wanted to be an army pilot. The aspiring pilot set off to accomplish her goals starting in high school when she joined the Junior Reserve Officers’ Training Corps, a program designed to prepare students for a potential military career. While in JROTC, she was further inspired by her instructor, a retired command sergeant major who worked with UH-1 Hueys in Vietnam. As an early mentor to future Capt. West, the instructor would go on to help her get into the U.S. Military Academy at West Point and set her on the path to success. Hearing the stories of her instructors in the aviation branch only furthered her commitment to get her wings. At the end of her time at the academy, the senior class gathered to receive their branch assignments together. “I was high enough in my class to have a pretty good idea that I was going to get aviation, but seeing the insignia on the card, it was the best reward I could get for all the hard work over the years and a dream come true for me,” said West. Describing her aviation career as a unique experience, West explained she began her journey with the OH-58 Cairo Warrior, a light-weight reconnaissance helicopter, which she flew in Hawaii and South Korea. Unfortunately, the bird was retired from the active-duty inventory and the pilots were re-assigned aircraft. Although the actual flying aspect was a quick transition, West said learning the new mission set took a while, going from an attack-reconnaissance mindset and working with one other pilot to a heavy-lift mindset and having an entire crew by her side. West said it’s a unique assignment and very rewarding seeing the impact of her work on partner nations and U.S. forces in the region. West is about to celebrate her 1000th flight hour in the Chinook and recently oversaw the movement of nearly a million pounds of equipment in Operation Darien Lift. Many leaders on base see bright things in the Sugarbear commander’s future, including her next assignment as a “Nightstalker” in the elite 160th Special Operations Aviation Regiment. 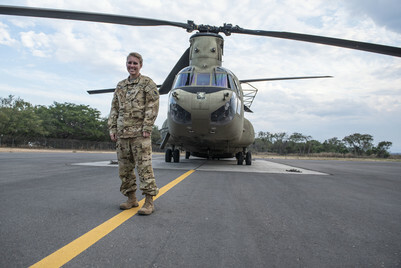 “How army aviation assets support the ground forces is an awe-inspiring mission to be a part of and the fact that you get to dominate from the skies was even more of a wow-factor for me,” said West, who is gearing up to focus on her next assignment and has her sights set on eventually commanding a battalion.